SF6-insulated switchgear is widely used in electrical transmission and distribution. The level of humidity in the sulfur hexafluoride, however, must be kept below its water saturation point. If the gas gets too wet, it loses some of its insulating properties; corrosion and dangerous leaks can also occur. A complete SF6 handling instrument monitors the quality of the gas, dries it out when wet, and, when necessary, replaces it safely. Sulfur hexafluoride (SF6) has excellent dielectric and heat transfer capabilities. That’s why it is the preferred insulator for power transmission and distribution (T&D) switchgear. However, humidity in the gas can decrease its insulation strength and promote corrosion in the equipment, leading to serious health and environmental problems related to leaks. Therefore, one of the top priorities for T&D engineers is to monitor the humidity level of gas-insulated switchgear (GIS). SF6 handling is crucial. As the humidity in SF6 approaches the gas’s water saturation point, operators must make sure the wet gas is replaced with dry gas. SF6 handling can be tricky. The gas is nontoxic, but it easily displaces oxygen in enclosed areas, which can asphyxiate nearby personnel. What’s more, SF6 is a very powerful greenhouse gas – 23,900 times more effective than CO2 in trapping heat. To ensure that no leaks occur, the T&D industry relies on SF6-handling instruments that 1) are designed to address safety issues and 2) comply with strict emissions regulations. For decades, WIKA’s experts have put their experience to work in developing better products that address market demands. Our latest gas products – pumps, compressors, transfer units, filters, humidity and gas condition measuring systems – use advanced technology to safely handle SF6. To simplify operations, WIKA has combined gas handling – filling, evacuating, cleaning, and venting – in one instrument for SF6 GIS equipment and linear accelerators. The cost-effective Model GPU-2000comes equipped with a humidity filter, particle filter, vacuum pump for air, oil-free vacuum compressor for SF6, and gas humidity measuring system. The standard model has a 300-liter storage tank; there is also the option for a 600-liter tank or no tank at all. The system sends an alert when the GDHT-20, a humidity monitor and transmitter, registers a value close to the maximum level allowed for the gas. Operators then have the option to either remove the wet gas and replace it with new SF6, or circulate the wet gas through filters to dry it out. The GPU-2000 is fast, efficient, low-maintenance, and intuitive. User-friendly features include a 10-inch IntelliTouch touchscreen and all components mounted on a compact cart with solid-rubber tires. A SIL (Safety Integrity Level) 2 design means operators can virtually rule out user errors, gas escapes, and overfilling the storage tank. With an USB port and WiFi readiness, this gas-handling unit is easily integrated into existing systems. 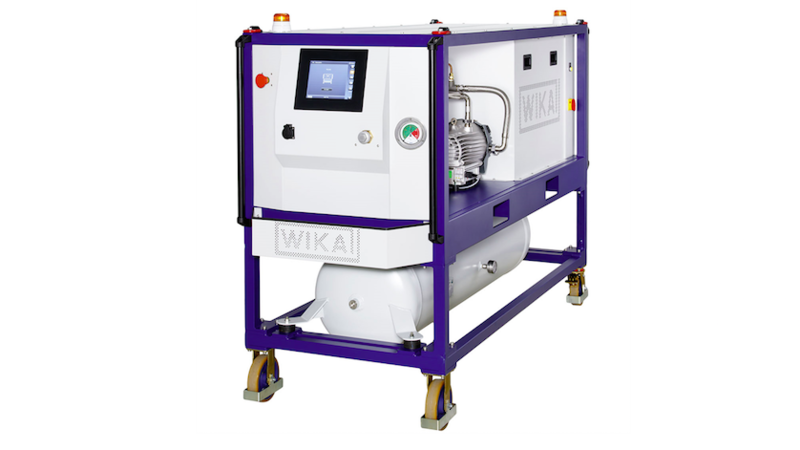 For more information about the GPU-2000 and other innovative gas-handling equipment from WIKA, contact our experts today.